Quiet worker. A conservative Intel Core i7, a dedicated graphics card from Nvidia and a fast SSD ensure great system performance. The manufacturer promises and delivers long battery life, despite all these powerful components. Find out more about this model in our in-depth review. The Chinese manufacturer offers a powerful and slim multimedia notebook in the Lenovo IdeaPad U530 Touch. Furthermore, the notebook offers great battery life (over 10 hours). The notebook fulfills the requirements to be called an Ultrabook and is thus tagged as such on the hand-rest regions. A conservative Core i7 offers sufficient performance alongside a fast SSD. Other configurations are also available. 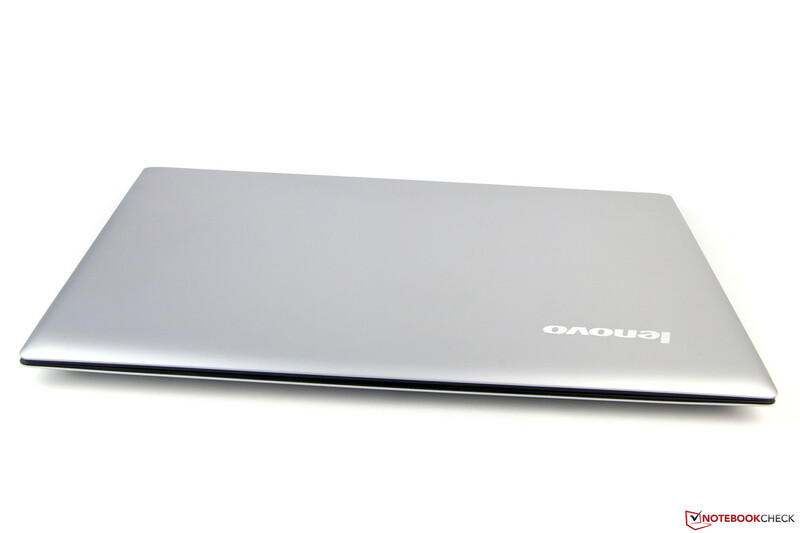 The predecessor, the Lenovo IdeaPad U510, has little in common with our test model. The series has been almost entirely updated by the manufacturer and is only similar on the outside. The U510 was plagued by a few flaws last year. The notebook chassis was not resistant and the feedback of the keyboard was not good. The panel was also relatively dark. The competition is strong. They also use Intel Core i7-4500U processors but employ different dedicated graphic cards. The HP Pavilion TouchSmart 15 uses a GT 740M and the Dell Inspiron 15 has a GT 750M. We will discuss how the U530 performs against the competition in the following in-depth review. The metal case looks good. However, small workmanship flaws are annoying. 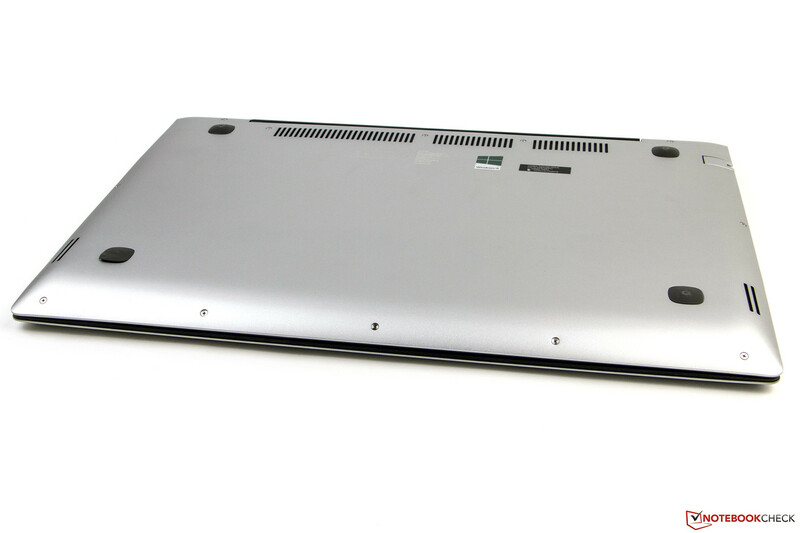 The case of the Lenovo IdeaPad U530 is composed of metal-covered components, which are comfortable to the hand. From the sides, the notebook reminds us of a thick MacBook Air and gives us a good impression. The weight of 2,328 grams is not light by any means, but considering the size, it is within reasonable limits. The metal-cased display is resistant but lets itself get bent inwards as easily as before (in the predecessor). If pressure is applied to the back of the panel, the screen reveals a slight wave. The borders of the display can be pressed inwards in many places. When closed, the gap between the panel and the base is not even. The base of the 22 mm thick notebook is very resistant. 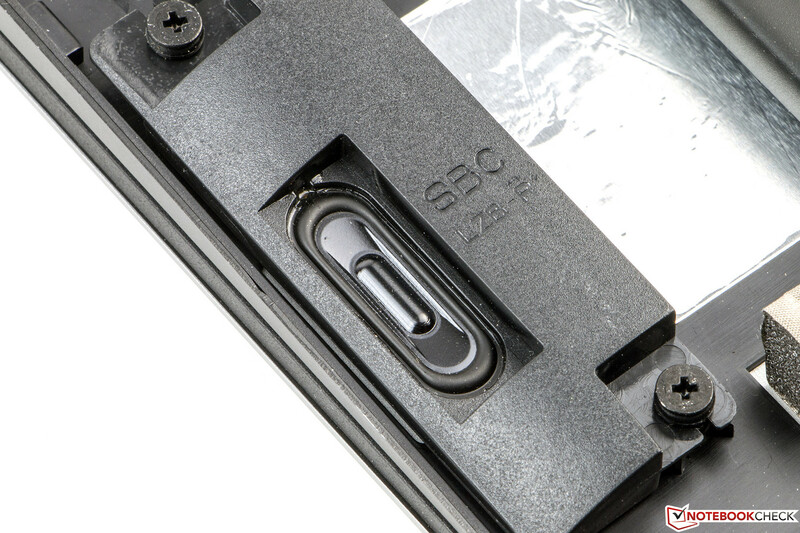 The hand-rest regions and the lower regions of the case are made of metal and are resistant to pressure. 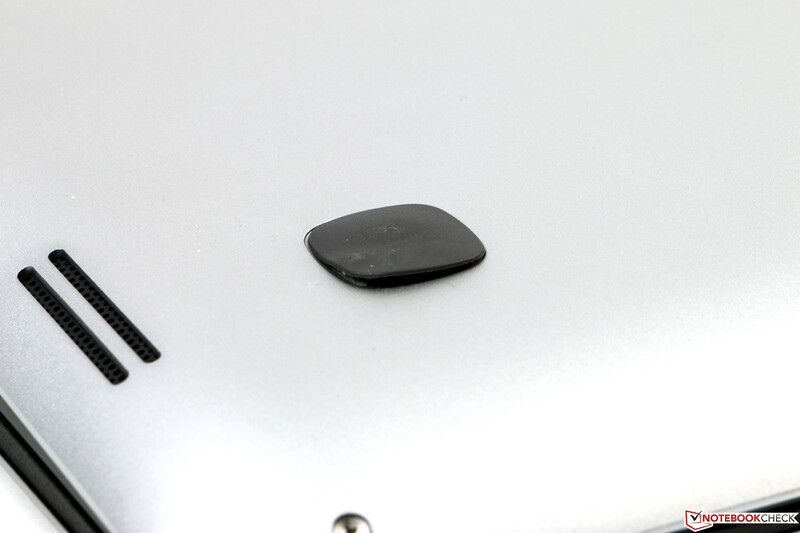 The black cover is prone to gathering a lot of fingerprints and smudges. Sadly, both parts of the notebook have rather sharp edges, dropping our rating of the workmanship, despite the good material, to decent. 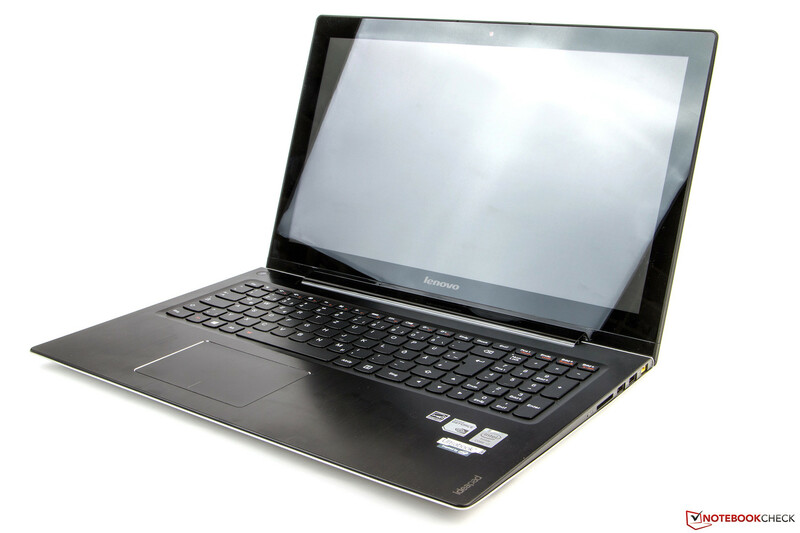 The connectivity of the Lenovo IdeaPad U530 is typical. One of the two USB 2.0 ports can charge devices even when the laptop is turned off, but this feature has to be turned on in the BIOS. The integrated card reader supports MMC and SD cards. Unfortunately, these cards cannot be inserted very far and tend to jut out of the laptop. The positioning of the ports is relatively close but overall good. Both left- and right-handed users can have enough space left to use an external mouse freely after plugging in all the ports. In terms of connectivity, the test model is well-equipped: A Gigabit-LAN port and a WLAN module from Intel (supports IEEE-802.11 standards - b/g/n on the 2.4 GHz frequency). Like many of the competitors, the 5.0 GHz frequency is not used. The range is decent: At a distance of 20 meters from the router (Fritz!Box 6360), the connection quality was good enough to surf the web. Bluetooth 4.0 is on-board and works without issues. This allows us to stream music comfortably. The provided accessories are limited to the power adapter (65 W). Special accessories for the IdeaPad U530 are not offered but universal extras, like mice, headphones, bags and external drives are available. The bottom can be opened up. The bottom of our test model can be removed: 14 screws need to be taken out. 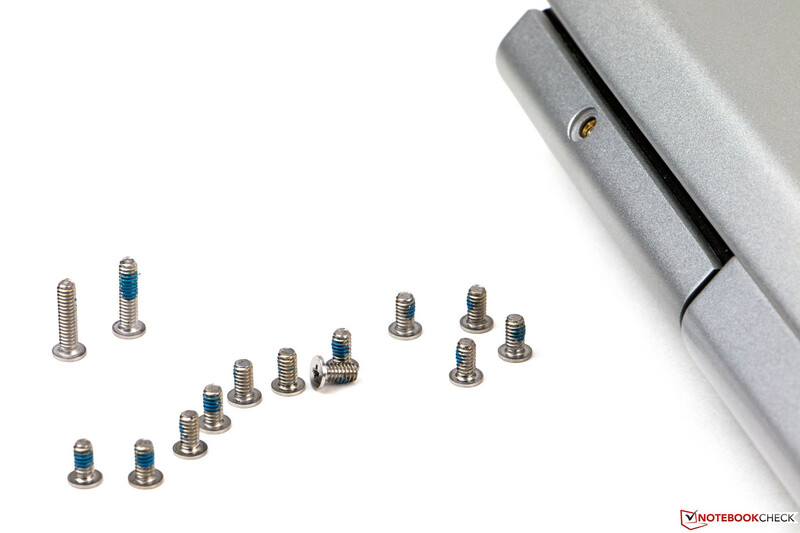 After removing these, the hardware components are well-accessible. The fan can be easily cleaned out. The securely integrated battery can be switched if required (in case of defect). The hard drive and the CMOS battery are also accessible. 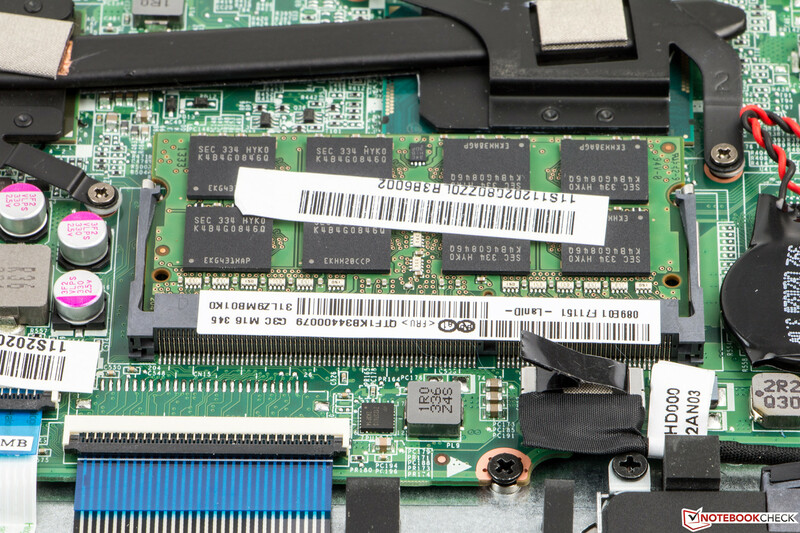 The RAM cannot be upgraded and only a single slot is available, preventing us from using dual-channel mode. However, the notebook has a free M.2 slot (42 mm) which can be used for flash storage. 24 months warranty is provided by Lenovo for the IdeaPad U530. If you want longer periods, take a look at the available service packets (starting at 51 Euros, ~$70) which are available for a premium. It is possible to ensure the laptop for up to three years with "on-site" service on the next workday and "accidental damage" warranty (275 Euros, ~$380). 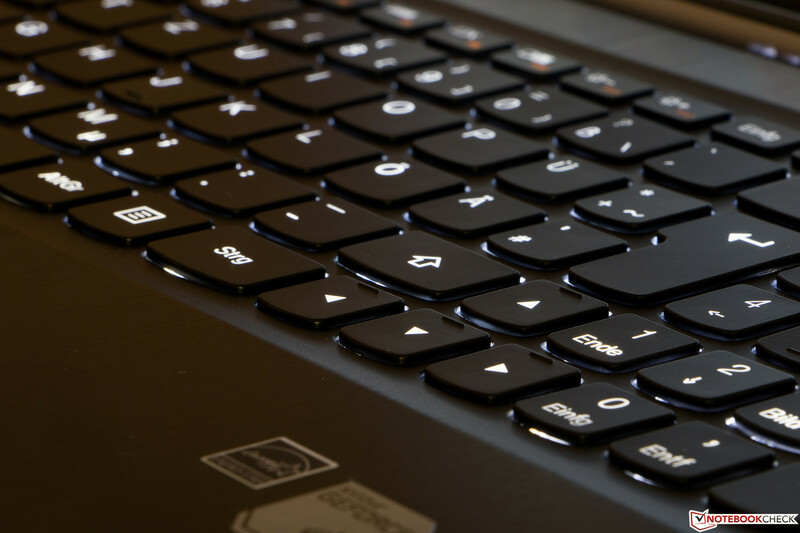 The keyboard of the Lenovo IdeaPad U530 is described as an "AccuType keyboard" and offers comfortable typing with few typing errors. It is a decent input device, which has a backlight and is quiet. The QWERTZ keys are each 15 x 15 mm, smooth and rounded near the bottom. The stroke distance is rather short and the pressure point is precise. After getting used to the keyboard, the user can work very comfortably. The keys are placed a little too close to the cursor keys. This and the small "Shift" key on the right side lead to a few mistakes while typing. We like the full-sized numeric pad and the fact that the Num and Caps lock button have an integrated status LED. 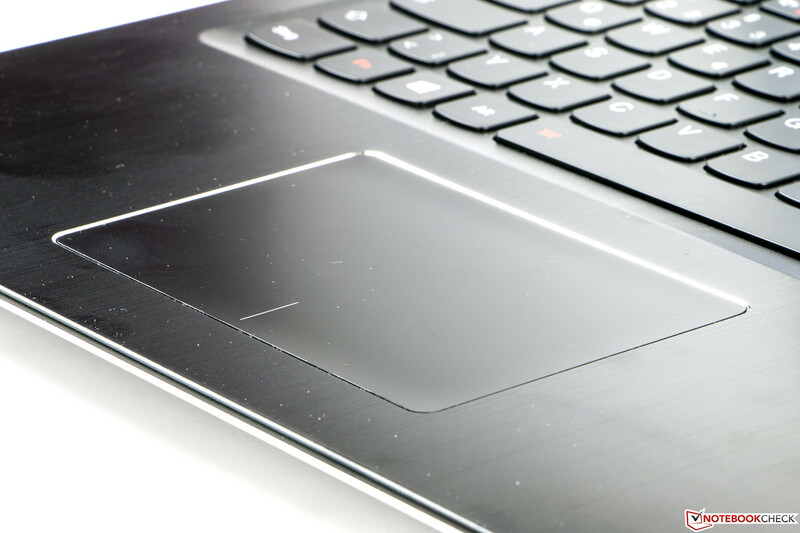 The touchpad of the Lenovo IdeaPad U530 is 110 x 70 mm big and fits perfectly in the case. The smooth surface ensures good sliding properties and allows the user to move the cursor accurately. The two integrated mouse keys have a clear pressure point, but they are hard to press and often cause the cursor to jump. Multi-touch gestures are supported and executed well. 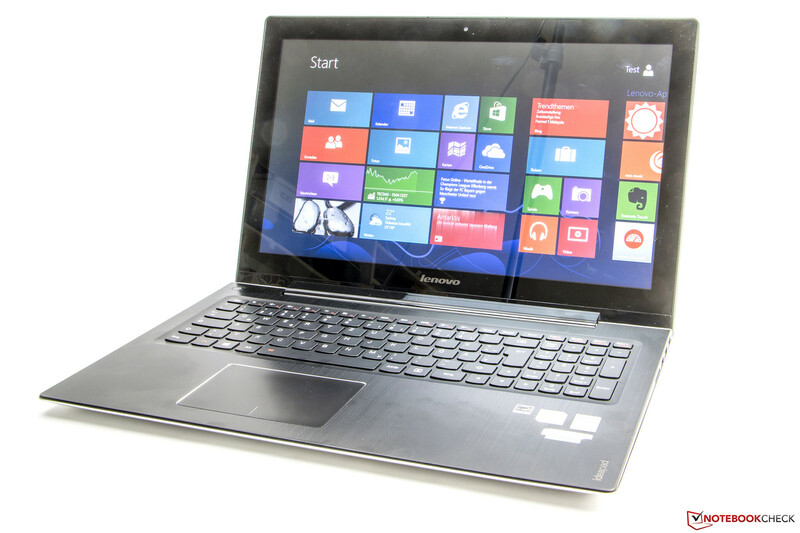 The touchscreen of the Lenovo IdeaPad U530 supports up to ten fingers. Its surface has good sliding properties. Input is received well and executed quickly. Near the borders, the input device works reliably. Due to the chosen resolution, even the icons on the desktop are easy to choose with touch. The 15.6-inch large panel of the Lenovo IdeaPad U530 Touch comes from the manufacturer Chimei Innolux and has a resolution of 1366x768 pixels. This results in a ratio of 16:9 and a pixel density of around 100 PPI. This is not very high and each pixel can be distinguished by the naked eye. However, this phenomenon is not disturbing and is advantageous when using the touchscreen, as Windows 8 has Modern UI (with tiles), as well as Desktop mode which is often hard to use with a touchscreen due to small icons. Multimedia fans will miss the Full HD resolution and we find the large gap between the synthetic material covering the panel and the display itself a little annoying. This is the reason why the user will feel like the input spaces are floating. The predecessor, U510 (max. 211 cd/m², 80%), was relatively dark. Unfortunately, Lenovo has not improved in this area. In fact, the test model reaches a max of 192 cd/m² in our test. The distribution of brightness is more balanced at 84%. The TouchSmart 15 (max. 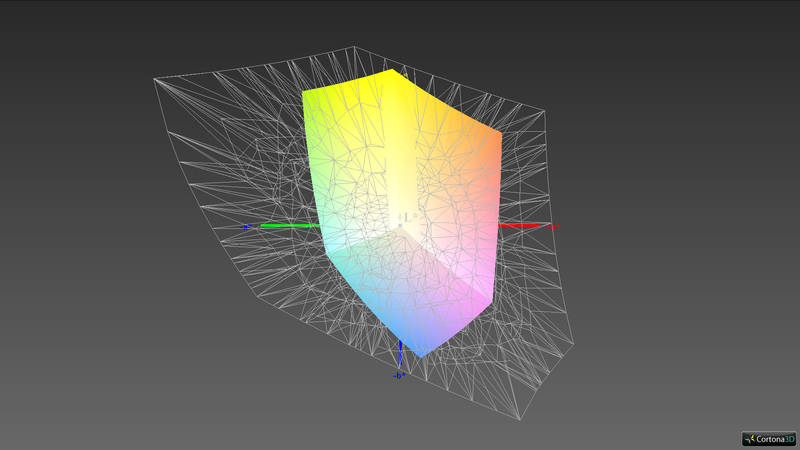 171 cd/m², 68%) offers even lower values. However, the Dell Inspiron 15 (max. 293 cd/m², 84%), is far better with its bright display. The black value of 0.49 cd/m² does not depict true black. The contrast of 392:1 is average too. The two competitors perform better in this area. 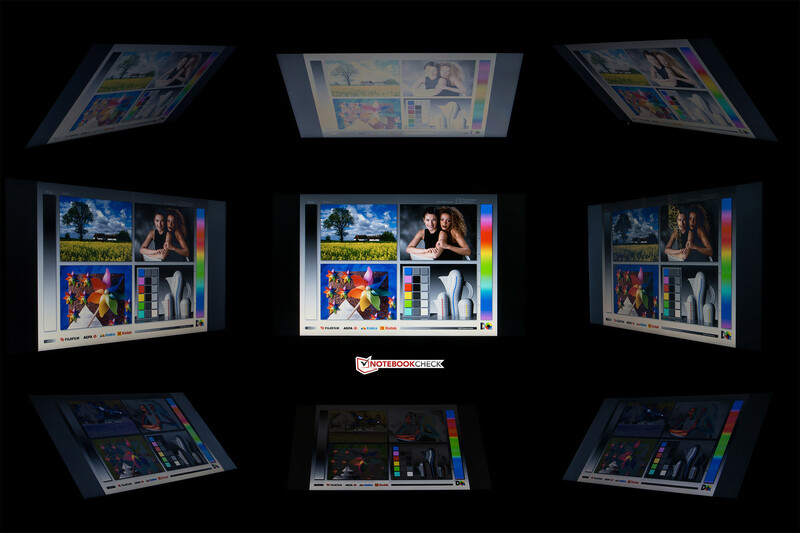 The TouchSmart 15 may have a low brightness but it offers a great black value (0.21 cd/m², 681:1). The LG Philips panel in the Dell notebook is best: It is far brighter than the competitors, offers a good black value (0.25 cd/m²) and has a high contrast ratio of 1,084:1. The color accuracy of the Lenovo IdeaPad U530 is not great either. The mixed colors and gray levels (dE 7/8) did not impress us and at times we could see the deviations with our naked eye. The resulting blue tinge can be alleviated after calibration. The color space coverage is not optimal for picture and video editing. The sRGB color space coverage is a mere 56%. Outdoors the laptop is hard to use due to the low brightness. If you sit in the shade, the panel will be legible but it will be hard to enjoy a film or photos. If you are in bright surroundings, the display is hard to read, as it reflects very strongly. Outdoors, not much is visible. The viewing-angle stability is not great. However, we did not expect much due to the TN panel. The panel of the Lenovo IdeaPad U530 can accommodate a single user. In this case, the brightness loss stays within limits if one looks at the panel from the side. If the panel is pushed too far back, the colors invert quickly. The test model is equipped with an Intel Core i7-4500U of the Haswell generation. 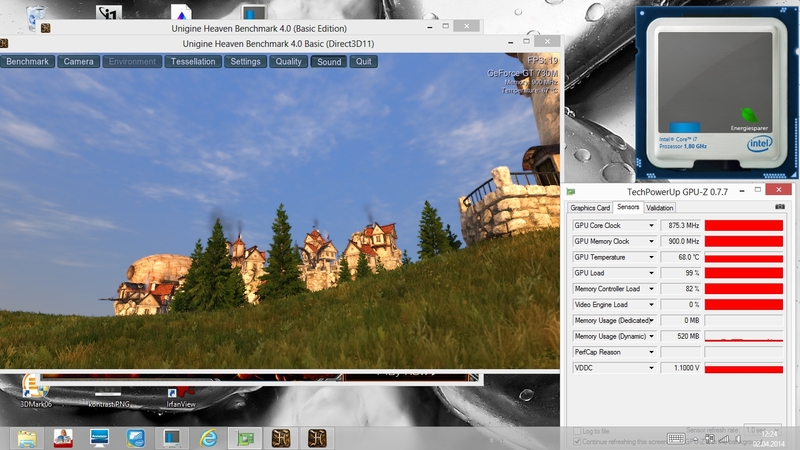 Aside from the Intel HD Graphics 4400, the system also uses an Nvidia GeForce GT 730M. The 8 GB RAM is quite a lot but it works in single-channel mode, which leads to performance restrictions. The flaw can not be alleviated as there is only a single RAM slot. 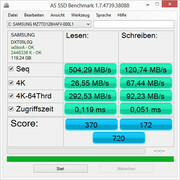 The SSD provides a significant boost to the system. 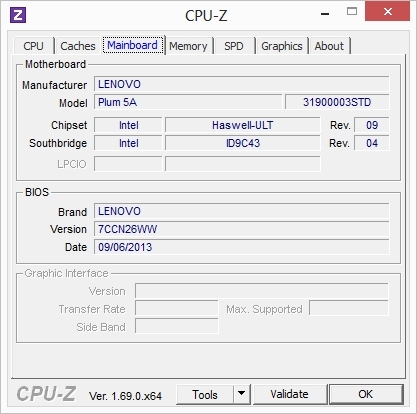 The Lenovo IdeaPad U530 uses an Intel Core i7-4500U, which has two physical cores. These cores have a base clock speed of 1.8 GHz and can be boosted up to 3.0 GHz (Single Core) via Turbo boost 2.0. 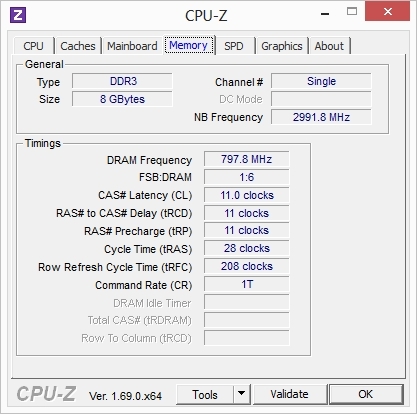 If both cores are used simultaneously, then the boost can offer a max of 2.7 GHz. Thanks to Hyper-Threading, we can process up to 4 threads. The TDP value of the conservative ULV processor (Ultra Low Voltage) is a max 15 W (incl. the IGP). 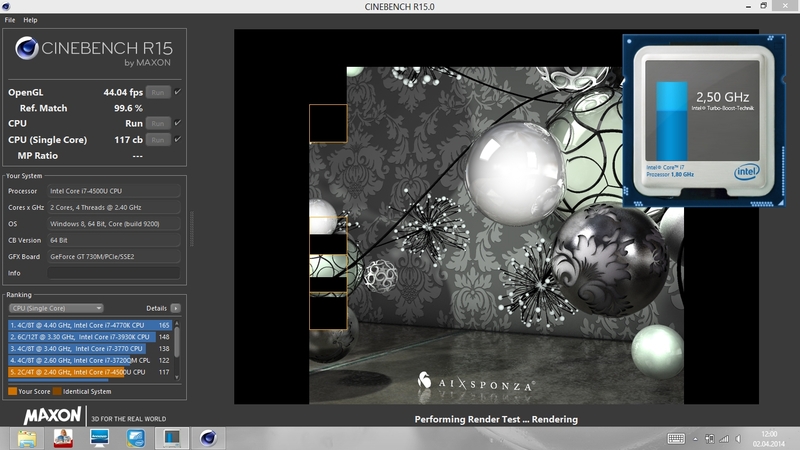 In Cinebench R11.5, the scores are at the expected level. 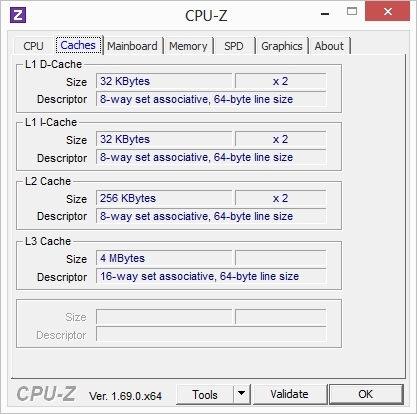 In the single-core test, the system scores 1.33 points whereas in the multi-core test, the laptop scores 2.74 points. This means it is slightly slower than the HP model (Multi: 2.84 points). During the benchmark, we observed brief clock speed drops which could be the reason for our test model lagging behind its HP competitor. 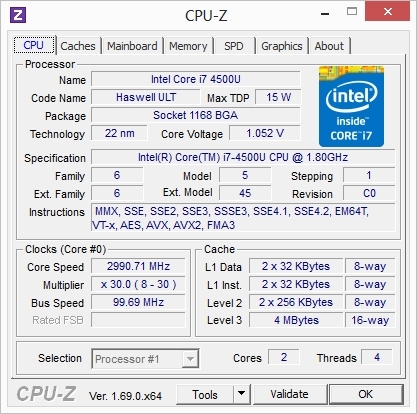 In the Single-Core test, the Haswell CPU is only slightly slower than the quad-core CPU of the ATIV Book 8 (Intel Core i7-3635QM), which has about 400 MHz more speed. This shows the improved performance per MHz between the two generations. On battery, the performance of the CPU drops strongly. This is due to the fact that it operates at minimum clock speed. This is good for the runtime, but when we ran demanding tasks, these performance limitations are easily noticeable. 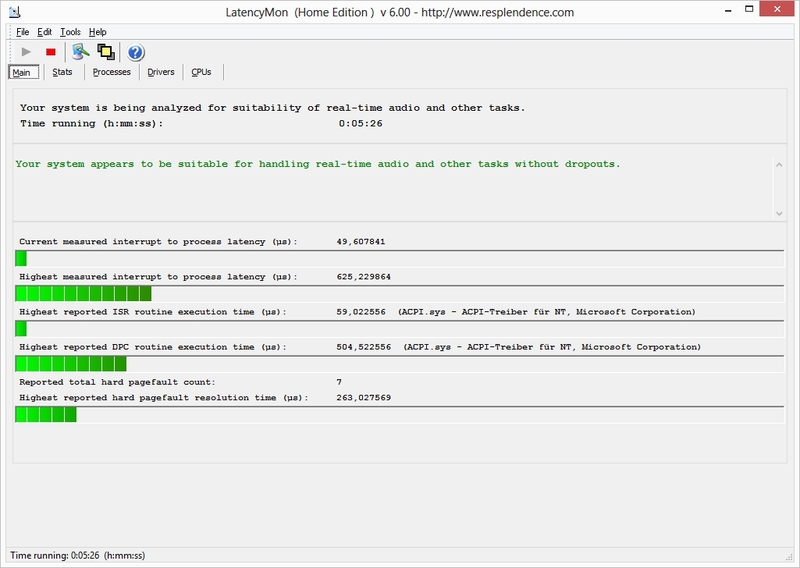 The system performance of the Lenovo IdeaPad U530 is great. 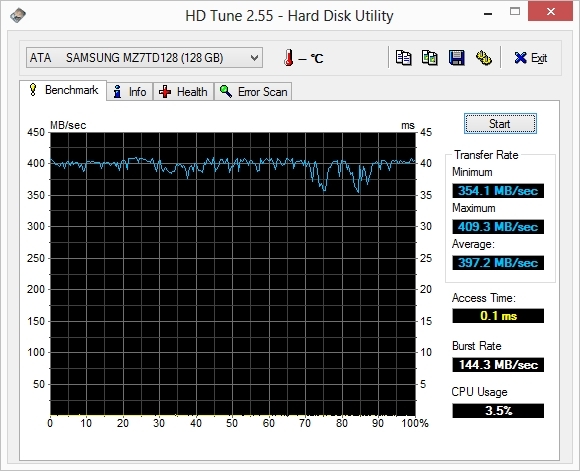 This is due to the collaboration of the fast processor and the fast SSD. Windows 8 wakes up within seconds and the boot process is quick as well. This is confirmed by the PCMark 7 benchmark (4,702 points). The benchmark always gives high scores to systems with a fast storage device. 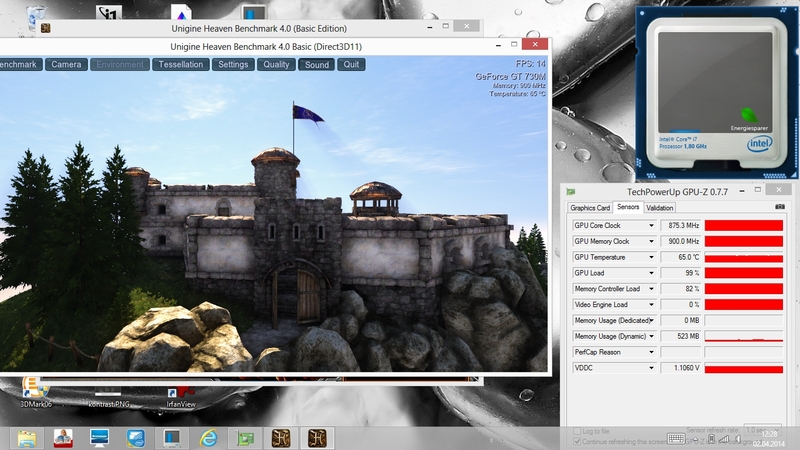 In this test, the test model can surpass even the Samsung ATIV Book 8 (3,290 points), which employs a mere HDD. 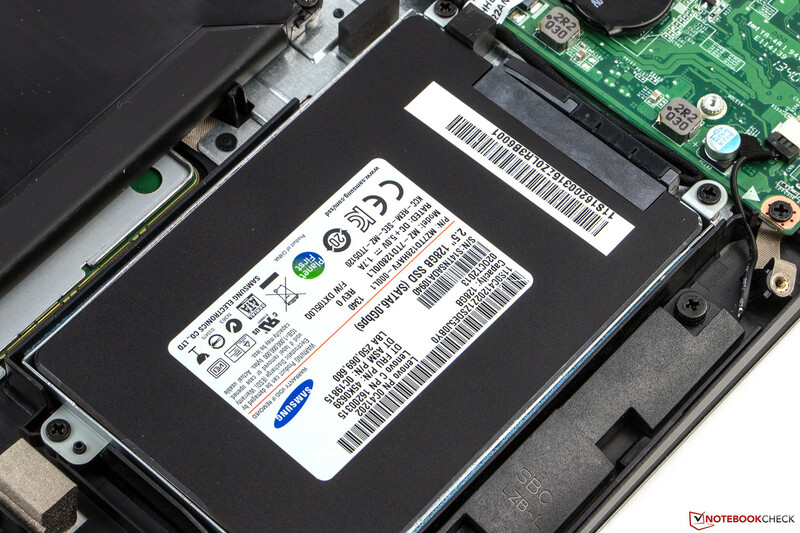 The Lenovo IdeaPad U530 uses a Samsung SSD SM841 for storage. The drive offers 128 GB storage space and is very fast. It delivers good benchmark results. 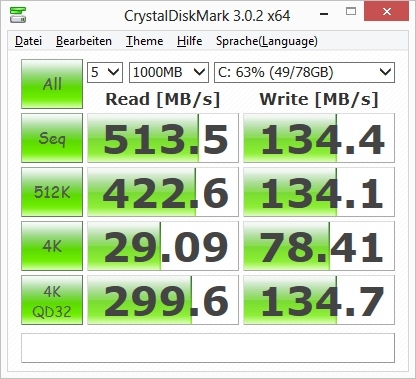 The sequential read rate (513 MB/s) and read rate of small files (4k, 29 MB/s) are quite good. In the Dell Inspiron, the Samsung 840 Pro (536 MB/s / 37 MB/s) offers good speed rates as well as it is one of the fastest drives on the market. The single flaw of the drive is the meager capacity. Lenovo makes matters worse by partitioning the drive further, so that only 56 GB is free and this is distributed over two partitions. There is not enough space on the drive for large software, like SPECviewperf 12. The Lenovo IdeaPad U530 has two graphics processors. 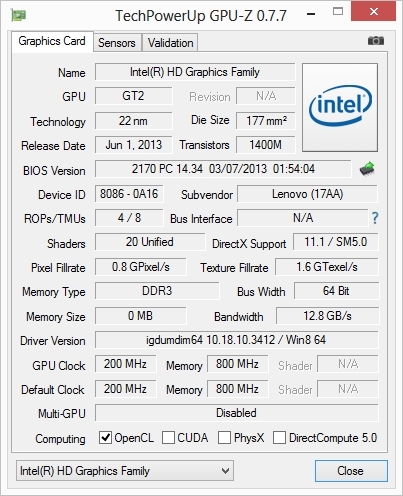 The integrated Intel HD Graphics 4400 (200 - 1,100 MHz) performs quite well in everyday use. If more performance is required, then Nvidia's Optimus technology automatically switches over to the dedicated GPU, an Nvidia GeForce GT 730M. The model has 4 GB DDR3 RAM and uses the new GK208 chip, which has a 64-bit memory interface. Our test model scores 5,177 points in the 3DMark Cloud Gate benchmark. This is a good performance, but the competitors, HP (GT 740M, 5,466 points) and Dell (GT 750M, 5,766 points) have stronger GPUs. The latest drivers must play a vital role in this case as well as BIOS settings, which are missing in the Inspiron 15, which drops its Physics values. The Acer Aspire V5-573G has the same GPU as its competitor from Dell, but due to its weaker CPU it can only offer lower scores. On battery, the full performance of the dedicated GPU is available, which means the user can game on the go. 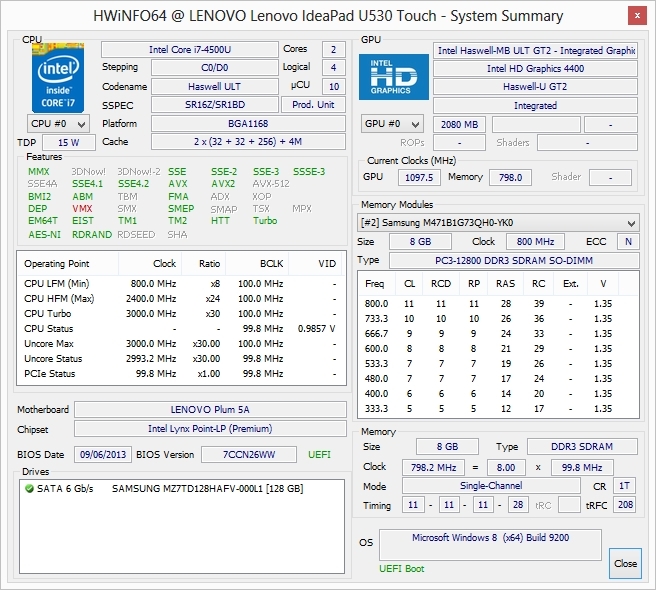 The gaming performance of the Lenovo IdeaPad U530 is above-average. 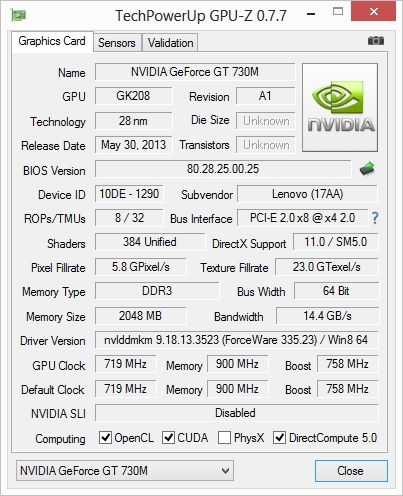 The middle-class graphics card Nvidia GeForce GT 730M offers sufficient performance for most games. Older or less-demanding games run at full details. The latest 3D shooters will require the user to lower the settings. This notebook is ideal for occasional gamers. 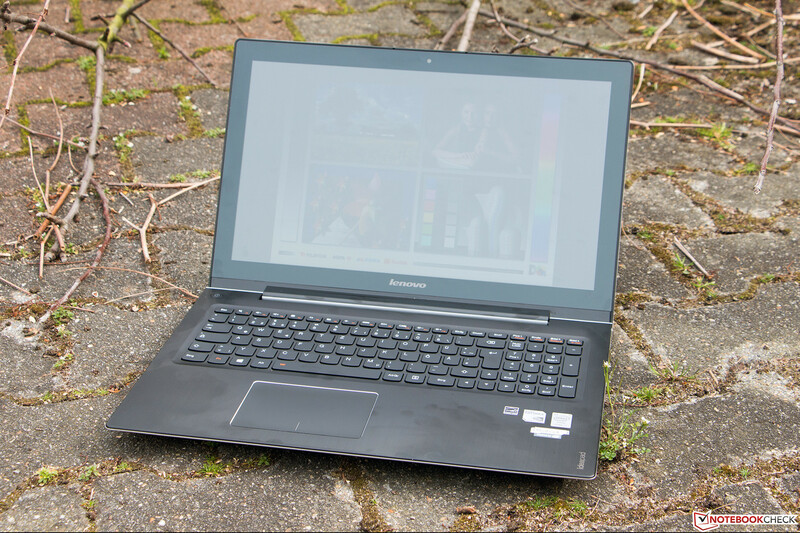 The noise emissions of the Lenovo IdeaPad U530 lie in a comfortable region. While idle, the fan hums at a max 32 dB(A). At load, the test model does not get much louder and hits a max emission of 37 dB(A). The competitors have higher values in this case. The Inspiron 15 can reach up to 42.5 dB(A) and the TouchSmart 15 reaches up to 50 dB(A). This is due to the stronger GPUs which require more cooling. Stress test: CPU @ 2.3 GHz; GPU @ 875 MHz. 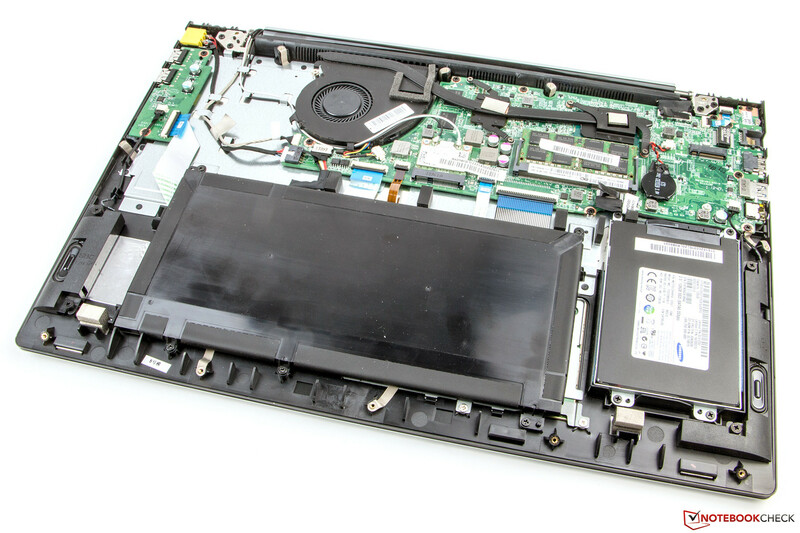 The Lenovo IdeaPad U530 has a great cooling system. While idle the surface temperatures stay under 27 °C. At load we measure up to 42 °C, which means the test model is far cooler than the competitors. The HP TouchSmart reaches up to 44.1 °C and the Dell Inspiron hits 51 °C. In the stress test, the test model is quite good. 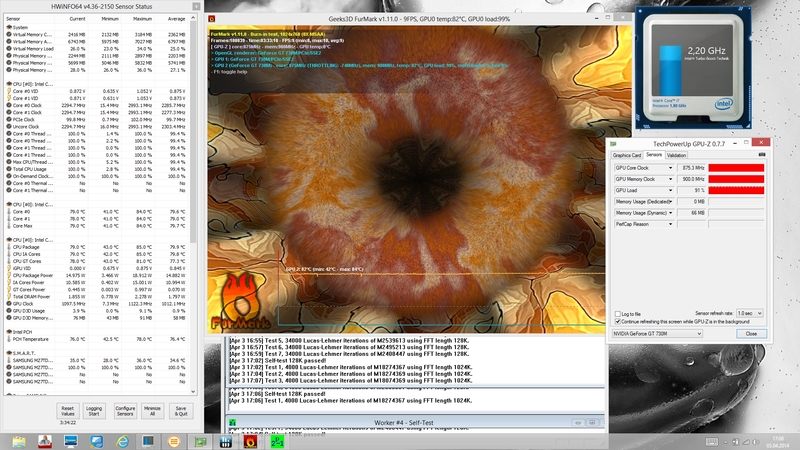 While running FurMark and Prime95 simultaneously for over three hours, the system stays stable. The GPU executes its tasks without dropping in performance. The processor has to throttle down to 2.3 GHz. This means that it is still clearly in the Turbo range. In everyday use, such extreme situations will never occur. The 3DMark06 benchmark we ran right after our test revealed that the laptop offered the same performance after a stress test as it did before we started. (±) The average temperature for the upper side under maximal load is 32.5 °C / 91 F, compared to the average of 30.9 °C / 88 F for the devices in the class Multimedia. (±) The maximum temperature on the upper side is 42 °C / 108 F, compared to the average of 36.5 °C / 98 F, ranging from 21.1 to 71 °C for the class Multimedia. (+) In idle usage, the average temperature for the upper side is 24.7 °C / 76 F, compared to the device average of 30.9 °C / 88 F.
(+) The palmrests and touchpad are cooler than skin temperature with a maximum of 28.5 °C / 83.3 F and are therefore cool to the touch. (±) The average temperature of the palmrest area of similar devices was 29.1 °C / 84.4 F (+0.6 °C / 1.1 F). 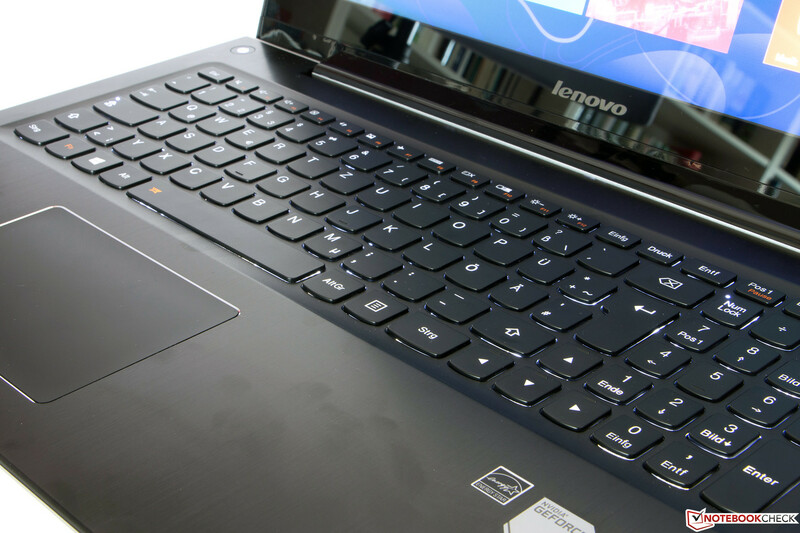 The integrated stereo speakers of the Lenovo IdeaPad U530 give us a good impression. High notes are clear but tend to echo with the default settings. This can be fixed using the Dolby Home Theater equalizer provided. The bass is thin. Overall, the sound is much better when the laptop is on a solid surface. The audio output via the jack is good. Audio streaming via Bluetooth works without issues. 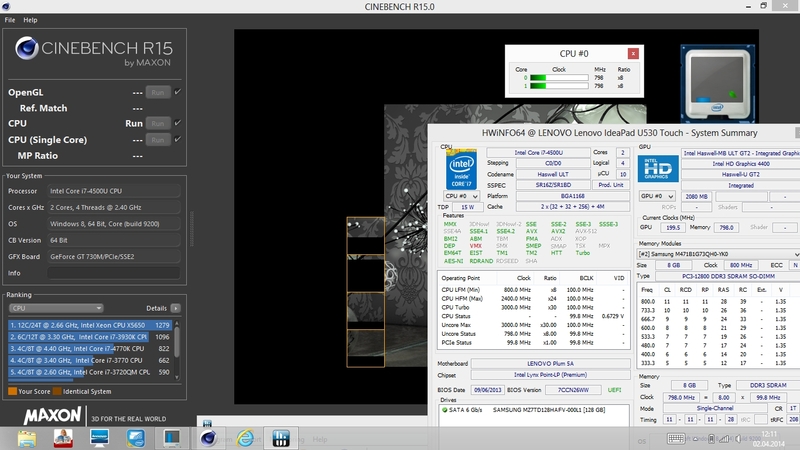 While idle, the Lenovo IdeaPad U530 consumes 5.4 - 6.9 W. In this case, the conservative Haswell CPU can shine. The test model consumes a little less than the Inspiron 15 (5.4 – 9.9 Watt), which has a much brighter panel. The max power consumption is measured using a stress test. The U530 is very conservative and requires a max 41.9 W. The larger power consumption of the competitors is probably due to their stronger GPUs. 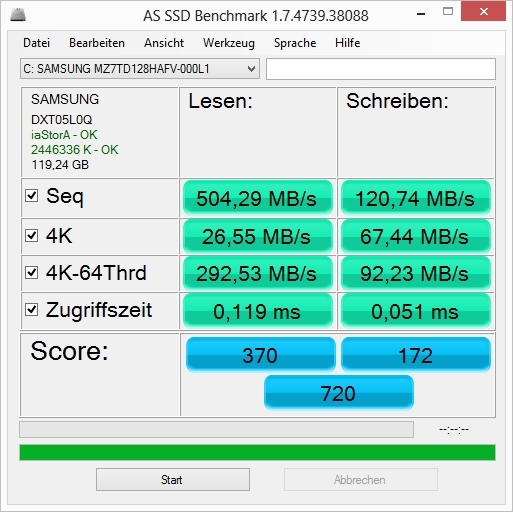 It is surprising that the TouchSmart 15 requires a max 42.5 W. This is mainly due to the heavy throttling it suffers from during the stress test. The power adapter of the U530 has a performance of 65 W. It is more than enough for this laptop. 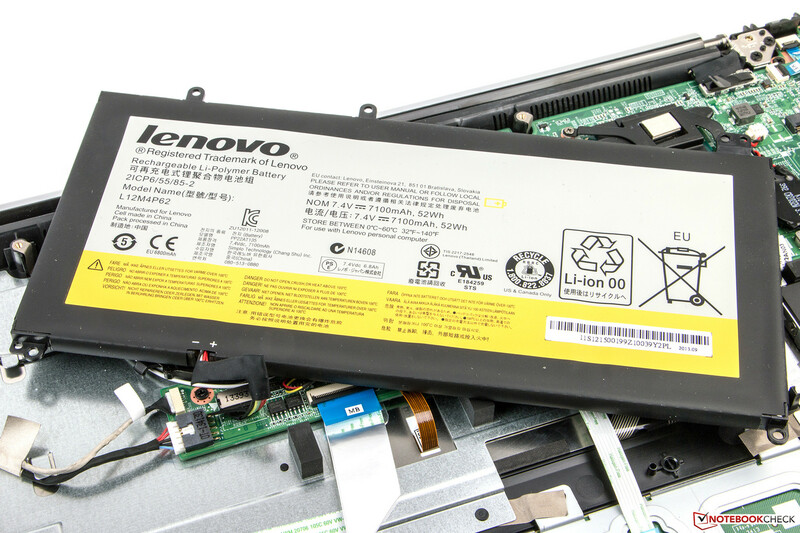 The Lenovo IdeaPad U530 uses a 52 Wh battery and thus achieves very good runtimes. The max runtime surpasses the specification of the manufacturer. In our surfing via WLAN test, the display is set to 150 cd/m² and all modules are turned off except WLAN. We run a script which loads a website every 40 seconds. In this test, the test model lasts nearly 11 hours. This is a great value and the competitors, HP TouchSmart 15 (4:36 h) and the Dell Inspiron 15 (6:32 h), lie far behind. Under the same conditions, we run a Full HD video on the U530. This test completes with a runtime of over 8 hours. This is also a great runtime but in this case, we could clearly notice the throttling of the CPU while on battery. However, the video still ran fluidly. 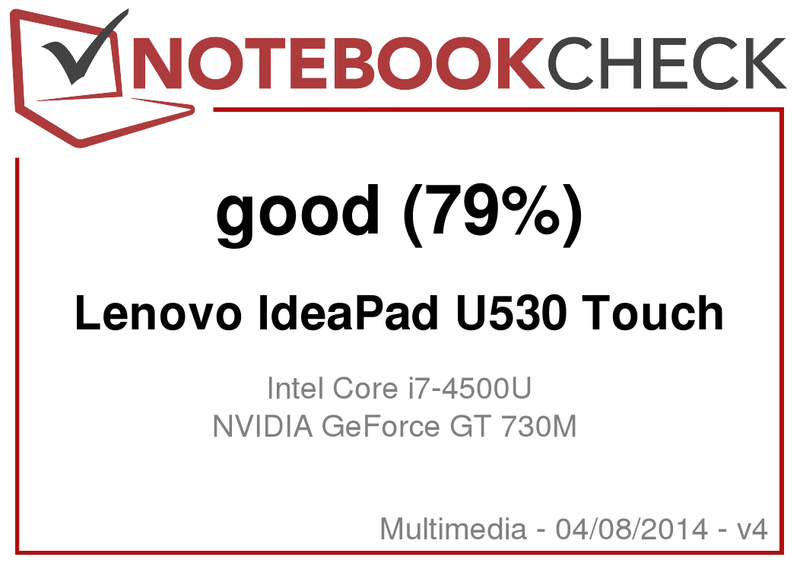 In review: Lenovo IdeaPad U530 Touch. Test model provided by Lenovo Deutschland. 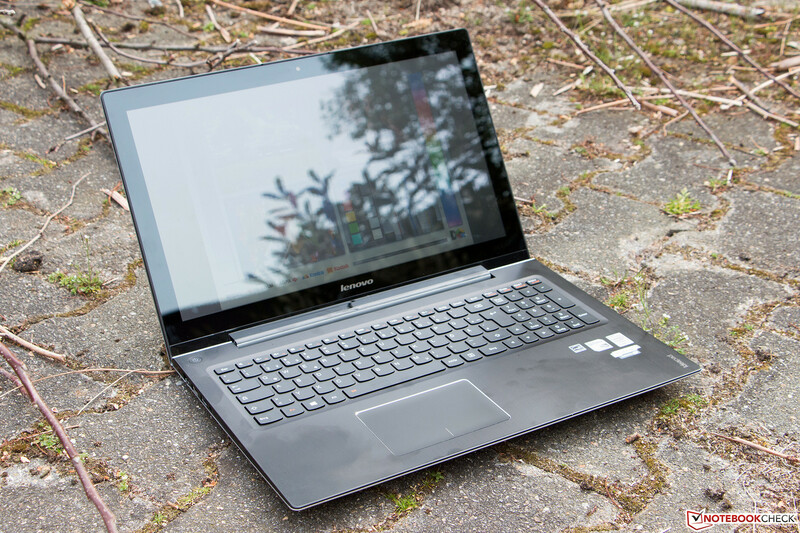 The Lenovo IdeaPad U530 Touch is a quiet work mule. The performance is sufficient for most tasks and occasional gaming is possible. If you travel a lot, the battery life will see you through long journeys and the slim design does not hurt either. The flaws are glaring: The workmanship is good but it is not perfect. The manufacturer does not repeat the mistakes made in the U510 but instead makes several new ones. The largest flaw is the panel. The resolution could be higher (considering the panel size) and a bright, IPS panel would have done this model a world of good. However, as such, the test model should not be used in bright surroundings. While we are on this topic, the Dell Inspiron 15 has the best display in this category. 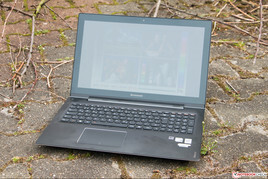 The excellent runtimes, the backlit keyboard and quiet fan, make the U530 an interesting device. Media playback with decent speakers would be a nice extra, if it were not for the modest display. The notebook leaves us with mixed feelings, but it will find buyers. 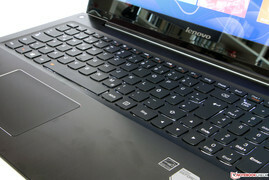 In Review: Lenovo IdeaPad U530 Touch . Test model provided by Lenovo Deutschland. The aluminum look makes the U530 feel very high-quality. The 1366x768 pixel resolution is acceptable but the screen is too dark. The bottom is made of metal too. Fourteen screws must be removed to take off the bottom flap. The RAM cannot be upgraded further. The speakers are quite good. The storage device can be easily swapped out. The integrated battery offers 52 Wh. The notebook is very quiet and has great runtimes. A brighter display with higher resolution would be appropriate for this price class. How quiet a notebook can be at load and yet offer such good performance. The competitors are Dell Inspiron 15, HP Pavilion TouchSmart 15, Acer Aspire V5-573G as well as V7-582PG and Samsung ATIV Book 8.